Funeral Services for Gary Krutke will be held at 2:00 pm on Wednesday, August 16, 2017 at the Prescott High School, 1010 Dexter Street in Prescott, WI. Visitation will begin at 10:00 am that morning at the high school. The Wisconsin Honor Guard Association is assisting Chief Krutke’s family and the Prescott Police Department in planning and organizing funeral events. ​WHGA is asking for law enforcement assistance to help facilitate the following honors for the Chief: color guard, casket watch, and door guard. Any questions or offers to assist in the aforementioned roles can be directed to Sergeant Tom Wahl, Chippewa Police Department, twahl@chippewafalls-wi.gov. Chief Krutke will be received at the Prescott High School at 8:30 AM on Wednesday, August 16th, 1010 Dexter Ave Prescott, WI. Responding honor guard personnel (including color teams) should be at the High School no later than 8:00 AM to attend a briefing and to prepare for the Chief's arrival. This briefing will be held in room C112 (sign boards will be at the main entrance). There is ample room to ground associated gear and a changing room will be available if needed. Color Teams will be briefed in C112 at 12:30 PM. Casket Watch and Door Guards will be staffed following the Chief's reception at approximately 9:30 AM. The memorial service will commence at 2:00 PM and conclude at approximately 3:00 PM. Upon the conclusion of the service, officers will be dismissed to the parking lot to form a gallery and a procession will follow thereafter. The procession will leave the High School and will make a loop through town and will come back and pass by the high school. At HWY 35 and Hwy 10 intersection, Chief Krutke, members of Prescott PD and the Hearse will continue onto Ellsworth WI. Chief Krutke will eventually continue on from Ellsworth, WI to Florida for a full military rites burial. The procession will end at Highway's 10 and 35 intersection. Officer's wishing to proceed out of town can do so at this time. The Family and Prescott PD is offering a Luncheon for those that wish to stay at the old Ptacek's IGA Grocery Store on Orrin RD and Campbell St. This location is just prior to the intersection of HWY 35 and Hwy 10 and the there will be lead cars in the procession leading to this destination. Those wishing to be involved in the procession are asked to park in the Northwest parking lot of the high school which is the student parking lot. There will be personnel directing processional vehicles into the student parking lot. Those not intending to be in the procession may park on the street. Chief Gary Martin Krutke, age 57 of Prescott WI, died on Saturday, August 5, 2017 at Regions Hospital in St. Paul MN, after a long battle with cancer. Gary was born January 2, 1960 in Daytona FL to parents Gerald M. and Jo Ann (nee Bozeman) Krutke. Gary later moved with family to Sheboygan WI, where he graduated from North High School with the Class of 1978. Gary enlisted and served in the United States Army, and later enlisted and served with the United States Marine Corps. While deployed in Iraq, Gary was wounded in combat operations, and earned the Purple Heart. He would serve in active duty, and in the reserves, for over thirty years. Gary would further his education at St. Cloud State University, where he earned his Bachelors degree in Criminal Justice. From there, he embarked on career in law enforcement that spanned more than thirty years. 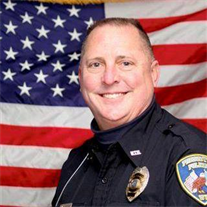 Gary served as an officer in other jurisdictions from both Minnesota and Wisconsin, before joining the Prescott Police Dept, where he would be appointed Chief on January 13, 2014. Throughout his life, Gary enjoyed radio controlled airplanes, snowmobiling, and boating, and especially loved to ride and build Harley-Davidson motorcycles. Much of Gary’s life was dedicated to serving his country, and the community in which he lived. His service to others spoke volumes to his character. Gary was a strong man with a soft heart. His police officers will remember him as an honorable and patriotic leader. Those in the community will remember him as a firm, yet fair, man. He will be missed by family and friends alike. Gary is survived by his fiancée Tanya Keenan; his children, Joe Krutke, and Brittany Krutke; his granddaughter, Elizabeth Krutke; his mother, Jo Ann Krutke of Waycross GA; his siblings, Greg Krutke of Waycross GA, Karen Reseburg of Jacksonville FL, and Peggy Ann (Rev. Howard) Hass of Sheboygan WI; his beloved dog, Meeka; as well as numerous nieces, nephews, other relatives and friends, and his brothers and sisters in the law enforcement community. Gary was preceded in death by his son, Jared Krutke; and his father, Jerry Krutke. Funeral Services for Gary Krutke will be held at 2:00pm on Wednesday, August 16, 2017 at the Prescott High School, 1010 Dexter Street in Prescott WI. Visitation will begin at 10:00am that morning at the high school. Burial with full military honors will be held at a later date at the Jacksonville National Cemetery in Jacksonville FL.